The ruble made significant gains against the dollar and euro and Russian stocks rose sharply on the back of statements of the Russian president that indicated a more conciliatory approach the situation in Ukraine. Russian President Vladimir Putin has expressed his support for a peaceful resolution of the conflict in Ukraine following a meeting with Austria's head of state, President Heinz Fischer. Putin has also called upon Russia’s Federation Council to revoke the right to deploy Russian troops in Ukraine, which was granted to him by parliament in March. Russian stocks rose sharply on the back of the president’s statements. Additionally, Putin urged the upper chamber of the Russian parliament - the Federation Council - to revoke his recently granted right to use military force on Ukrainian soil. The Russian ruble rapidly gained in value against the dollar and euro following Putin’s statements: In a single day the ruble strengthened sufficiently to match rates last seen in January. The MICEX and RTS, the two main Russian stock indicators rose 2.2 percent to 1,518 points and 3.8 percent to 1,421 points, respectively. In turn, the stronger ruble increased demand for bonds. Long-term bonds increased in value by about 50 bp. Furthermore, shares in Russian energy monopoly Gazprom rose 4.1 percent in a single day. “It is no secret that these financial quotations take into account all the facts and expectations of investors, and the risks as well. In recent months, the main driver of the Russian market has been geopolitical risk stemming from the conflict in Ukraine,” said head UFS IC analyst Alexei Kozlov. According to Kozlov, one element of this risk stemmed from concern among Western countries about a Russian intervention in Ukraine. “President Vladimir Putin's refusal to employ the military in Ukraine has had a positively effect on the growth of the ruble,” explained analyst Alexander Maximov of financial company Aforex, referring to the five-month high reached by the currency on Tuesday. “As before, the ruble's value is supported by high Brent Oil Price showings of around $114 a barrel,” he added. The market's response had been just as sharp back in March 2014, sparked by the news of Crimea's annexation by Russia and the Federation Council's granting Putin with the right to send armed forces into Ukraine. In a single day, the RTS and MICEX indices tumbled by 4.8-5 percent upon opening, shares in state bank VTB fell by 9.5 percent, the country's largest bank Sberbank lost 9 percent, and Gazprom shares dropped 6.4 percent. Russian analysts have expressed hope that the ruble will strengthen further in the near future. Putin's statements will also decrease the probability of further economic sanctions being leveled against Russia during the June 26-27 European Union summit in Brussels. Putin's pronouncements have repeatedly had an impact not only on stock markets, but on the financial quotes of particular companies. The best-known instance of this took place on June 24, 2008, at a conference in the Nizhny Novgorod Region “On Developmental Measures for Ferrous Metallurgy and the Support of Metals Production for the Domestic Market”. The Russian president accused the company Mechel of selling coal domestically at inflated prices. At the time, the company’s main owner, Igor Zyuzin, was absent from the conference for health reasons. “I think that Igor Vladimirovich [Zyuzin] should get better as fast as he can. 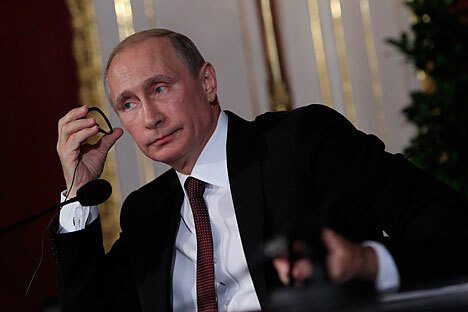 Otherwise, a doctor will have to be sent to clear up all these problems,” Putin said. After this statement, Mechel's shares fell by 38 percent in a single day. “This event demonstrated the state's intention to interfere in price formation on the metals market, directly affecting the capitalization of companies in the industry. That is how the market reacts to such statements, which have considerable economic consequences behind them,” explains Alexander Dorofeyev, general director of the consulting company Arkaim. As journalists of the Russian weekly magazine Kommersant-Vlast later calculated, Putin's statement on Mechel was comprised of 108 words in all. Given that the company's capitalization shrank from $15.5 billion to $10.7 billion, each word could be calculated to have cost Mechel $44.4 million. Two years later, Putin admitted that he regretted his attack on Mechel and praised the company for its more recent accomplishments. After this, the company's stock price on Wall Street immediately grew 7.7 percent, and its market capitalization increased from $8.59 billion to $9.25 billion. That is, on this occasion the Russian president uttered 68 words, and each word brought the company $9.7 dollars.